When outside layer and inner canals are empty - hair brakes and frizzes. Protein is the only one solution to keep it strong shiny and healthy. Linkage Meu is a new Milbon Japanese professional conditioning hair treatment. It is a 3 step process that will deposit amino oil, moisture and will build a fresh natural smoothing coat on outside! Instantly recovers your hair to its healthy and shiny structure. 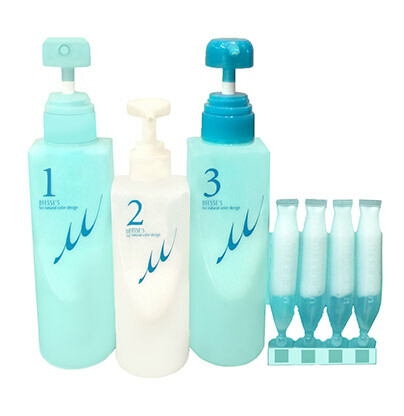 It has three different types of treatment developed individually for fine, medium or heavy hair types. Includes a complimentary package of 4 tubes for home use. PPT is the only procedure in the world that covers and restores all proteins and moisture. We make all our formulas according to different levels of dryness and hair texture. This 3 step pure protein complex contains no detergents and will fortify and renovate your hair naturally. Protein is restored deep into the cuticles, penetrating into the broken part of the cortex in each strand, rebuilding the hair from inside out. Four proteins of varying molecule sizes are applied in combination to achieve healthy hair, nearing that of newly grown hair. Procedure takes from 20 to 30 min to complete, depending on individual's length and thickness and can be done before or after Linkage Meu. Step1: A treatment rich in keratin restores lost protein at the inner layers of each hair strand. Step2: Aqua rebuilds lost protein at the middle inner layers of each strand. Step3: Collagen strengthens the outer layer, helps to seal the micro holes and scratches and boosts the shine with a very strong base. This procedure will help you get the exact hair color, and will protect your hair color from fading. It will also keep your hair glossy, enhancing shine and body and increase elasticity, which will prevent breakage. Whether used before or after hair straightening - chemical services, this hair treatment provides a layer of protective protein agents to repair damaged cuticles and makes it silky and shiny.